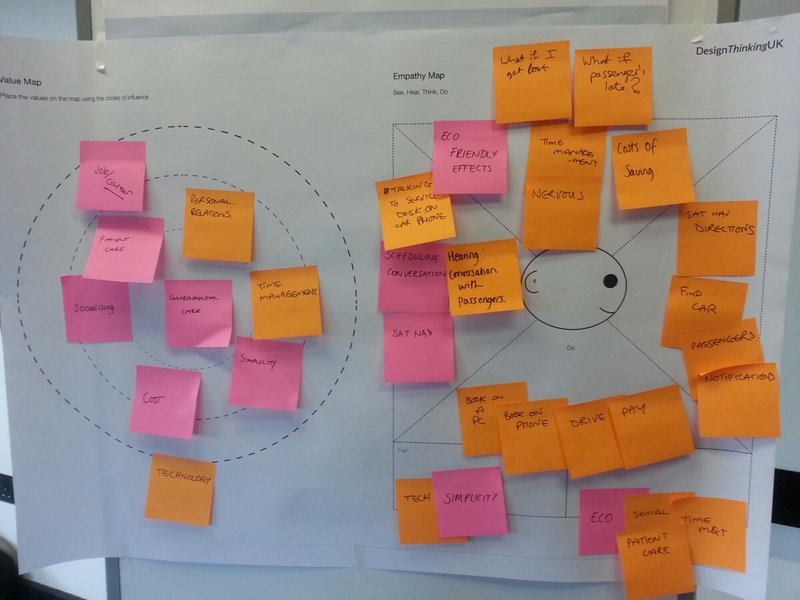 Last week I went to a Service Design workshop hosted by Design Thinking UK. 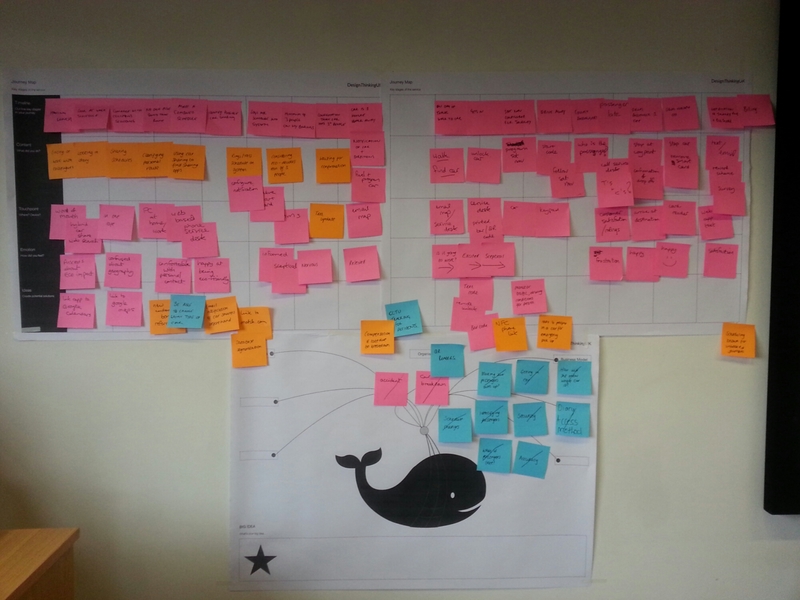 Service Design in a day may sound like an impossible task, but the day was far from it, and what a day it was! 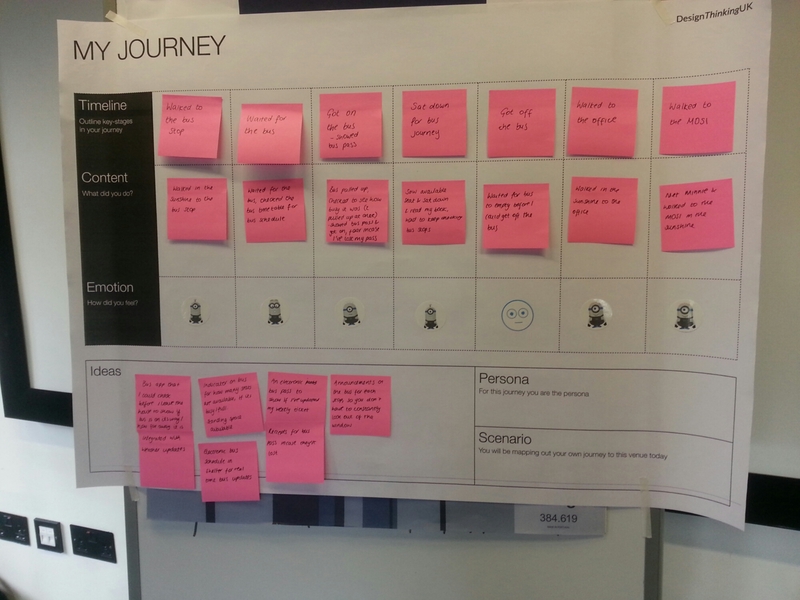 Now, you’ve heard me go on and on about customer journey maps and that’s because they’re an essential part of Service Design. One thing that I loved about the Service Design In A Day workshop, was that from the get go, attendees were pushed to embrace Service Design. We began the day by mapping out our own journey to the workshop (help at the wonderful MOSI). After understanding the timeline aspect, the content, our emotions on our journey as well as our ideas on how to make our journey better, we all mapped out our personal journeys. After a quick break (with cookies) we were asked to present our journey maps to the rest of the attendees. A running joke quickly followed about managing to get a seat on public transport (you really had to be there for it be funny) and I soon realised how easy customer journey mapping can be, when you make it something as personal to your own journey to a destination, home or in this case workshop. What the exercise of personal journey mapping also did, was show each of us (and the workshop hosts) whether we, as participants, were gens or synths. That is, whether we generate loads of create ideas, or whether we sit back and question ideas to create the most realistic, tangible outcome. To save time (it’s difficult to do Service Design in a day), Ed and Tej had created, in true Blue Peter style, some pre-completed persona cards and scenarios. Each person and scenario featured a new service – a car sharing scheme. The scheme was to be implemented in Manchester with cars generously donated by Honda, to make the city a greener more efficient place to work and live. The two personas given to the two groups were arguably polar opposites. One was a tech savvy, business orientated young man, the other an old school, young woman, who cared more about the environment and her patient care than keeping up with the Jones. I was tasked with the young technophobe lady, and our team had to create a service that was perfectly suited to young Mary’s needs. We began creating our service by dissecting the scenario given to us. We needed to understand Mary’s core values in order to build our services to her needs. We quickly were able to that she held the environment as her core value, with everything else falling outside in the outer rims. This information was vital to understanding how our service was going to shape to her persona, after all if she’s not happy with the car sharing service, she’s not going to use it! By understanding Mary’s core values, we could soon start imagining her journey with out car sharing service. We were quick to depict how she would learn about the service, how she would get to use it and why she would want to use it. It’s easy to get swept away with the day, particularly when you want to make sure that the service isn’t going to fail. We therefore made sure, that at every step of her journey, her core value was being attained. Thus Mary needed constant validation that she was helping the environment through tailoring the service to her needs. We followed the same process for Mary’s journey, as we did for our own. Detailing the timeline, the content, her emotions and our ideas, we were able to see how her journey needed to take place and how it would eventually need to be improved. One of my favourite learnings from the day, was the use of a Fail Whales. Fail Whales (and some of you might recognize the imaged) come from when Twitter first started, and their servers weren’t good enough to support all of Twitter’s users. What would follow was the Fail Whale, telling people to try again later. 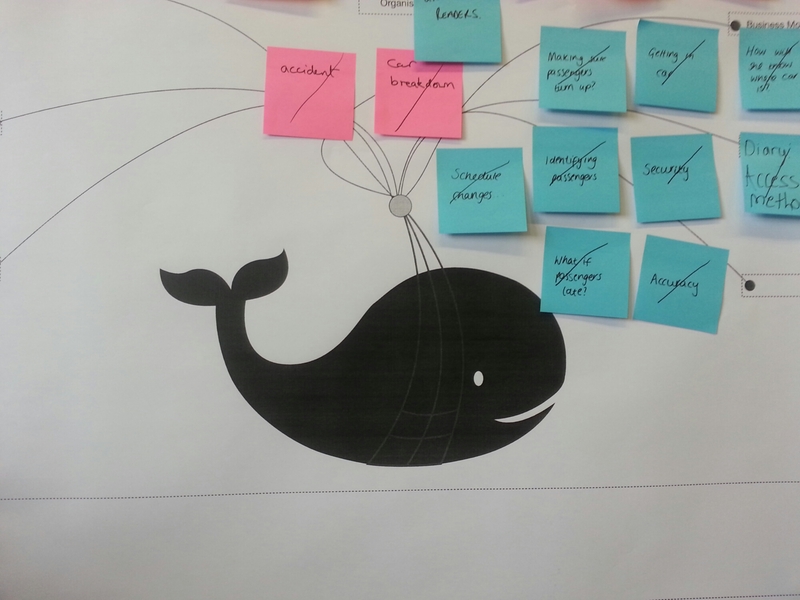 What we used the Fail Whale for, were roadblocks to our ideas that could consequently knock the service over. Instead of spending time focussing on these failures, you stick them on the Fail Whale to go back to when the journey is over. This means the creative process isn’t stifled by trivial roadblocks that tend to resolve themselves, but also allows people to think about what could go wrong. Gens and synths unite! We then took our ideas and mapped them on a cost and effectiveness chart, so that we would only be moving forward with the most cost effective ideas, that would make our car sharing scheme sustainable as well as effective. At the end of all of this you end up with the Big Idea. This doesn’t necessarily have to be one idea, but the main idea that sums up the service you’ve created and how it’s going to work. Last but far from least, we were left to prototype our ideas. Our group chose to storyboard our service, and give Mary a chance to live through our drawings. Presenting can often seem like a tedious task, but being swept up in Service Design makes it so much easier. Other ways of prototyping include mapping out an app or website using paper templates or apps to create them, or simply doing a role play (there was no way I could convince my team of doing a role play)! What we were left with was a four stage process of how Mary would use our car sharing service, the technology needed as well as how we met all of her core values. There we have it, a quick break down of how to do Service Design in a day. If you fancy reading a bit more about Service Design, check out my other blog posts here and here. Previous Previous post: Why is Service Design Important?